Kurukshetra/Patiala: In the face of rising input costs and a bumper harvest of rice which has dampened open market prices, farmers in Punjab and Haryana are demanding that the government increase the minimum support price, or MSP, and at the same time throw in a bonus of Rs100 per quintal. MSP, the price the government assures farmers to avoid distress sales, is currently fixed at Rs850 for the common variety of rice. Farmers in Punjab and Haryana, which together contribute around one-third of total rice procurement in the country, largely grow the superior grade-A rice variety that has an MSP of Rs880 a quintal. On Thursday, the Union government announced a bonus of Rs50, which has pushed up the MSP for regular rice to Rs900 and of grade-A variety to Rs930 per quintal. Several farmers that Mint spoke to, before the government announced the bonus, maintained that only an MSP of Rs1,500 will help the farmers make “decent" profits. “With the rise in inputs costs, an MSP of Rs880 per quintal is meaningless. Prices of diesel and pesticide were much higher as compared with last year. Plus there has been a shortage of labour and DAP (di-ammonia phosphate), which made us shell out money on them," said Chandra Bhan Sharma, who owns 20 acres of land in Kamoda village in Haryana’s Kurukshetra district. He is joined by fellow farmer Nar Singh, who owns 15 acres in the same village. “Only a price of Rs1,500 will help farmers make some profits. Besides high inputs costs, we had to buy DAP in black and pay extra as mandi (market) taxes. So how can we make profits," he said. According to Punjab government estimates, a Re1 hike in diesel increases the cultivation cost by Rs100 per hectare. Diesel prices have risen by Rs4 a litre since last year. Electricity is free for farmers in Punjab. In addition, farmers in the two states who are dependent on labour from Bihar and Jharkhand had to pay out more wages as labour was scarce in July and August, when the rice is transplanted. S. Raghuraman, head of trade research at Agriwatch, an independent research and consultancy firm, agrees inputs costs have been on the rise. “Labour shortage is a genuine problem, so is DAP shortage, which forces farmers to pay higher prices in the grey market." “Diesel prices have also risen by over 13% since last year and mandi taxes comprise 17-18% of the support price. So farmers are justified in demanding higher support price as also bonus," he said. But he quickly added that the government will refrain from giving additional bonus as this will fuel inflation because of increase in the price of rice. As on Thursday, more than 88% of the country’s total rice arrival of 6.7 million tonnes (mt) was procured by the government for its central pool. The target for the year is 27.5mt. India’s rice production for 2007-08 has been pegged at 96.4mt, which is around 22% of world production. Total stocks with the Food Corporation of India, or FCI, is around 7.3mt. The ruling United Progressive Alliance government at the Centre had fixed an MSP that was 14% higher than that provided last year but substantially lower than the recommendations of the Commission for Agriculture Costs and Prices, which advises the government on pricing of agricultural commodities. The government’s decision was influenced by the fact that inflation measured by the Wholesale Price Index was in double digits and was accelerating. Any increase in the MSP would have further pushed up the prices. Punjab chief minister Parkash Singh Badal has sought an MSP of Rs1,000 per quintal apart from a bonus of Rs300. The government, however, is not budging. “The MSP of Rs850 per quintal is certainly good as this is higher than last year’s and also based on sound rationale," said Alok Sinha, chairman and managing director of FCI, which is the government’s central procurement agency. He also indicated there is no case for a higher bonus. Farmers are not convinced. Gulzar Singh, who owns 30 acres in Rani Majra village of Punjab’s Mohali district, said, “Labour costs of transplanting saplings has risen from Rs700 per acre to Rs1,500. This cost has to be factored in through a higher bonus." Baldev Singh of Alamgir village in Mohali agrees. 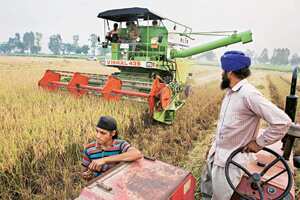 “Farmers will be encouraged to grow paddy only if they were given a price between Rs1,500 and Rs1,800 or else they will shift to other crops. I would say we are justified in demanding a bonus of Rs200," he said. Another development that added to the plight of farmers this year are unexpected rains. “Depending on the stage at which rains affected the paddy crop, there has been a loss of 20-50% in actual yield. The government should compensate us for that," said Avatar Singhof Jalalpur village in Patialadistrict. Associated to this, there have been problems of high moisture content and discolouration of rice. Rice having high moisture as also discolouration is largely rejected in the market by the arhtiyas, or middlemen, who buy rice from farmers to sell to the government agencies. “Due to rains and floods in my area my paddy has got discoloured and is not being procured. I will have to dump it in the local market at very low rates," said a dejected Mahinder Singh of Khanpur village in Patiala district of Punjab. Badal has written to Sharad Pawar, Union minister of agriculture, to relax the specifications of moisture (from 17% to 20%) as also discolouration in rice. Bajinder Pal Singh contributed to the story.